New #Scifund Class: Enhance your research with an online open access notebook. Sketchnote by Perrin Ireland from ScienceOnline 2012. Are you sick of taking lab notes in a paper notebook and toiling over organizing it? Do your labmates pester you with questions because they can’t read your handwriting or understand your shorthand notation? Do you waste time sifting through old notes to find specific protocols or results from experiments past? Well then jump into the 21st Century and learn how to improve your notebook and enhance your research by learning about open notebook science. Open notebook science is the practice of making your entire research project available online as it is recorded. It is the electronic analogue to the paper notebook you keep for experiments, and is intended to supplement and enhance the scientific process. By keeping your notes electronically, you will benefit from an automated organizational system with innate search capabilities. By publishing your notes online, they’ll be available to you no matter where you are as long as you have an internet connection. You’ll even be able to take notes away from the lab, if such a situation were to arise. By making your notes openly accessible, you’ll have the added benefit of being able to share research and communicate with colleagues and collaborators in real-time. You will also be able to get credit for the information you share and can supplement your publications with the details in your notebook. Now you can start your very own FREE open notebook, and the Scifund Challenge can help! Our next course teaches you everything you need to know about keeping an open notebook and will show you the best tools to do it with. In addition you will learn the truth behind the misconceptions of publishing online and how it can actually protect your research. 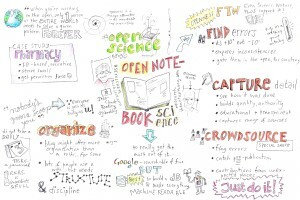 Scifund 201 – Open Notebook Science: Enhance your research through open access note taking. Cost: FREE. However, we aren’t just giving this course away. Course participants must pledge to share what they have learned with their colleagues. Where: The Internet! This course will be a highly interactive community effort and will take place largely through Google+ and WordPress blogs. Who: Active research scientists in any country in any discipline at any level (from graduate student to emeritus professor to government scientist to NGO scientist). This course is intended to introduce open access into the research environment. An understanding of open philosophy and how it pertains to research. Experience publishing your notes openly, which encourages responsible lab behavior, develops writing and communication skills, and can supplement your outreach efforts. Benefits of electronic note taking such as search, easy organization, and real-time access for collaborators and lab mates (as well as yourself). Time that course participants should expect to spend on course: The course is broken down into 4 modules (roughly one every three days) and will require 1-2 hours to complete each module. Expect 3-4 hours of time dedicated to the course each week. Deadline for completing course application: June 14. To keep the class size reasonable, course participants will need to fill out a brief application form. Decisions on applications will be given later that day. want to have fun and willing to share their research with the world. Jai Ranganathan, Conservation Biologist, University of California, Santa Barbara. Co-founder, SciFund Challenge. In keeping with open principles, participants must agree to maintain their notebook in the open. This is not as scary as it sounds. The course instructors want to encourage open notebook science rather than force it, so the material you are asked to share will be at your own discretion. Open information can be regarded as a spectrum rather than an all-or-nothing philosophy. This course will encourage you to share any type of scientific information as long as it is useful to yourself first and foremost, and then potentially to others. Also, since this is a community-based course, the identities of those in the course will be known to all class participants. SciFund Challenge has done lots of science crowdfunding in the past. Is this course connected to crowdfunding? Not directly. The purpose of this course is to get scientist used to sharing scientific information publicly. The purpose of crowdfunding is to connect the public with science, and by maintaining an open notebook scientists can sustain this connection. Additionally, open notebooks provide a mechanism for communication between scientists and the public and is another form of scientific outreach. Other questions? Contact Jai Ranganathan (jai.ranganathan@gmail.com) or Anthony Salvagno (anthonysalvagno@gmail.com). Previous Thank you SciFund outreach class! Is there a way to watch the lectures or see the discussion without being registered for the class? I’m an interested undergrad who currently isn’t in a lab so I wouldn’t be able to share any research. Discussions won’t be available for this round because of limitations with Google+, but most course information will be open access, including what we will be using as a “textbook.” This course will also be available again at a future date so once you get set up in a lab you can join the fun.